This payment plugin is a for PayU plugin for online payments in Argentina, Brazil, Chile, Colombia, Mexico, Panama, Peru. This plugin can be downloaded from our site and installed using the default joomla installer. Choose PayU Latam for J2Store to configure. Enter the title for the payment mode. Choose the image that has to be displayed when the payment methods are listed in the checkout page. Enter the API key that is associated with your PayU Latam account. Specify the account id associated with your PayU Latam account. Mention the merchant id of your PayU Latam account. Choose Yes if you wish the site to be operated in test Mode.Note: Not for live sites. Enter the API key associated with your PayU Latam Sandbox account. The account id of your PayU Latam Sandbox account has to be provided here. The Merchant Id of the Sandbox account should be keyed in here. Choose the language for the Payment form. Choose the hashing method associated with your PayU Latam Sandbox account. The Id of the article that has to be displayed after the payment is made.This could be an article or a plugin or anything that has to be displayed after the payment. This plugin provides option to restrict the payment method for certain regions.You could select the regions for which the payment should be available. Text to be displayed upon selection of this payment method has to be typed here.If the site is multi-lingual, then a language constant could be provided here and an override could be performed. Text to be displayed before completion of the payment could be entered here.In case of a multi-lingual site, then a language constant could be provided here and an override could be performed. Text to be displayed upon completion of the payment has to be specified here.In case of a multi-lingual site, then a language constant could be provided here and an override could be performed. Error message that has to be displayed in case of any errors during payment should be given here.If the site is multi-lingual, a language constant could be provided here and a override could be performed. 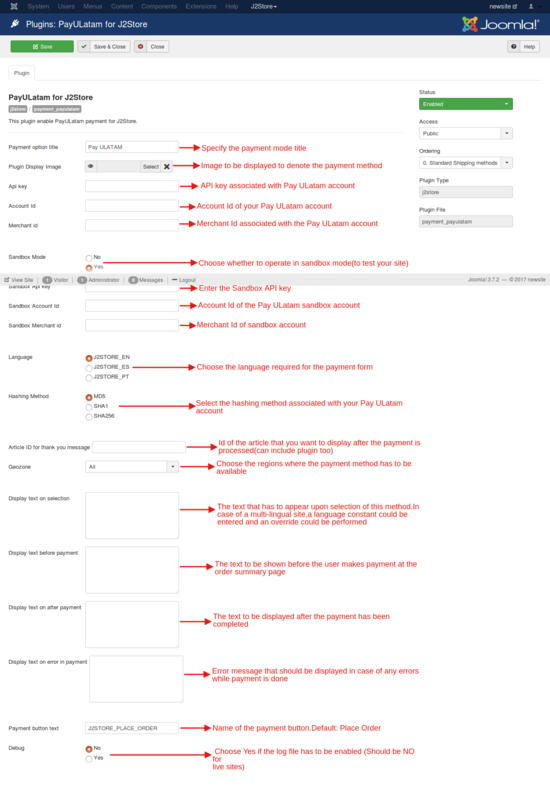 The default text being Place order,the name of the payment button has to be specified here. Select Yes if you wish to enable the log files.Note: Not for live sites.